Legend, revisioning and The Deadly Assassin (1976) | Randomwhoness: a Doctor Who blog by Johnny Spandrell. Sampling stories in random order. Occasionally, I’m going to write about the peculiarities of watching Doctor Who in Australia. I grew up watching Doctor Who in the late seventies and throughout the eighties. This meant tuning in to ABC TV – then the only station available nationwide – of a weeknight (sometimes Monday-Thursday, sometimes Monday-Friday) for The Goodies at 6pm and Doctor Who at 6:30pm. This is a shared cultural experience for Australians of my vintage, this regular post-school, pre-dinner treat. It’s our version of the “Saturdayness” experienced by UK fans. It’s historical potency is such that when ABC repeated the entire run of available episodes from 2003-5, it was back in that vicinity, at 6pm weekdays. What this meant was repeats and loads of them. UK viewers were starved of Doctor Who re-runs, and so engaged in a black market of off air recordings from down under. It’s a funny inversion, which meant that pre the VHS releases, Australian Whoheads were more familiar with the series’ past than UK fans. We got Pertwees and even a few Troughtons. But mostly we got Tom Baker, and specifically 4A to 4Z, Robot to The Invasion of Time. Over and over again. Well, not quite. Because two stories were routinely omitted: The Brain of Morbius and The Deadly Assassin. These stories had been rated as ‘adult’ and so couldn’t be screened in the early evening timeslot. Had you not known, you wouldn’t have missed The Brain of Morbius, but skipping The Deadly Assassin gave the series an odd dislocation. The previous story, The Hand of Fear, ended with the Doctor dropping Sarah back home, saying it was impossible to take her to Gallifrey with him. Suddenly in the next episode, he’s alone on a jungle planet making friends with Leela. Well, who wouldn’t? But what was so urgent that he needed to dump Sarah so unceremoniously? Anyway, we did eventually get to see Morbius and The Deadly Assassin in 1987 (thanks again broadwcast.org), by which time it couldn’t possibly have lived up to its reputation as one of classics. Personally, I could see the rubber crocodile and the plastic spider, but not what all the fuss was about. But it was my last ‘new’ Tom Baker story, so it sticks in my memory for that reason at least. But it sticks in fandom’s collective memory to a far greater extent. This is a mythic story, full of firsts. For instance, it’s our first view of the Doctor’s home planet Gallifrey, a world of emerald green vaulted chambers seemingly carved out of rock. Like America, it has a President, a CIA and a televised assassination. Like the Catholic church, it has cardinals and men in flowing robes. Like mediaeval Britain, it has castellans and a Lord Chancellor. It is a place of immense technology but also of state sanctioned torture. And it feels oddly parochial, with its insipid TV presenters, doddery old men and incompetent policemen. In fact, it feels like home. This earthly familiarity was famously criticised at the time of its UK broadcast, in a ranty review by Jan Vincent-Rudski, the closing line of which asked in strident capitals WHAT HAS HAPPENED TO THE MAGIC OF DOCTOR WHO? (That always makes me smile). As befits a mythic story, the review itself has become part of The Deadly Assassin’s legacy. It’s often seen as an example of how fans’ tastes change, as this once derided story is now widely praised. But it also shows how fans’ tastes mature over time, as they eventually put aside inconsequential concerns about continuity and focus on more lasting qualities such as writing, direction and production. But back to that parochialism; that accusation that the Time Lords of The Deadly Assassin are not the god-like super beings of previous stories, but familiar human archetypes complete with earthly shortcomings such as pomposity, foolishness and vanity. That accusation is spot on, and thank goodness for it. What would a story set on a planet of superbeings be like? Pretty dull, I expect. Time Lords are, in fact, elevated versions of ourselves, just as the Doctor is a kind of much enhanced version of us. When I stop to think about the affinity between the Doctor and Earth, and when we see it reflected in the Time Lords, I see an obvious plot point that I’m sure the series will get around to one day; that the Time Lords are somehow descended from the human race. You read it here first! (Moffat, call me, we’ll talk). In Old Who, this sort of episode – the “let’s take a break from the main story” episode – was usually an excuse to try something new. The Daleks’ Master Plan, for instance, had a comedy Christmas day episode. Planet of the Spiders has an episode which is an extended chase scene. Deadly Assassin 3 is no different; producer Philip Hinchcliffe wanted to experiment with an episode made entirely on film (it didn’t end up like that, but it is mainly all shot on location). But where this ep is different is that it’s usually praised as an inventive experiment, rather than discounted as a lazy indulgence as those other examples sometimes are. And that’s down to two things. First, it’s stylishly directed and tightly edited by David Maloney. Secondly, it’s so unlike anything else in Doctor Who; a physical and mental battle to the death between two men. It’s visceral stuff and ends with a watery strangulation, complete with freeze frame. That’s enough to get you banned in Australia. And amongst everything else, the Master returns. Having only recently randomed Terror of the Autons, I was reminded that The Deadly Assassin is effectively Robert Holmes’ second go at introducing the Master. He’s a character which could have easily been given a standard Time Lord regeneration (incidentally, why doesn’t Goth regenerate? Or any of the Time Lord guards who get shot? Shh! Look over there!) but Holmes makes him withered and decrepit. A smart choice which pushes the character in a new and lasting direction; from here on in the Master’s ability to cheat death and his quest to hang onto life become his enduring characteristics. Holmes pulls a few old tricks though. As in Terror of the Autons, the Master kills an innocent as a kind of greetings card. And he allies himself with someone to do the dirty work for him. But unlike the Delgado version, there’s none of that sly Master charm. This is just a snarling goggle-eyed fiend. Instead of the stylish Nehru suit, there’s only rags. There’s very little of the old Master left. Which is what I think Holmes wanted. He takes one of the icons of the Pertwee era and completely reinvents it. As Who Lore goes, Holmes was never happy bringing back old monsters and early in his tenure as script editor he struggled with Daleks and Cybermen. Here he allows an old enemy to return, but on his terms. And it’s difficult to read his venom spitting, subterranean dwelling troll of a Master as anything but a repudiation of the Letts/Dicks era’s version. You got it wrong, Holmes seems to say. The Doctor’s dark mirror image isn’t a smooth talking, dark suited man-about-cosmos. He’s a vile, repellent ghoul, consumed with hate. It’s better this way, says Holmes. Just like Gallifrey is better off as a corrupt, overblown oligarchy than a home on the clouds for superbeings. And by the way – you don’t even need a companion. That’s what The Deadly Assassin is about; tearing down the icons of the series and rebuilding them. But the show can’t always be like this. Next week it’s back to Doctor-Girl-Planet-Monster-Problem to solve. And it doesn’t feel like a step backwards; in fact it’s a relief. 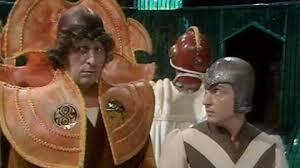 In that sense, The Deadly Assassin does its job a little too well. LINKS to The Armageddon Factor. Both feature black clad villains lurking in gloomy hideouts. And both reference the Doctor’s time at the academy. NEXT TIME: You know, I sometimes wonder if your friend is quite right in the head. It’s off to the thirteenth moon of Jupiter for Revenge of the Cybermen.